For instance the swing which has won 14 major championships for Tiger Woods also relates closely whereas in the highly individualistic techniques of players such as Fred Couples, Jim Furick and Sergio Garcia; correlation is only in the all important sweep-thru-impact phase. A vertical axis of rotation around which the body rotates. 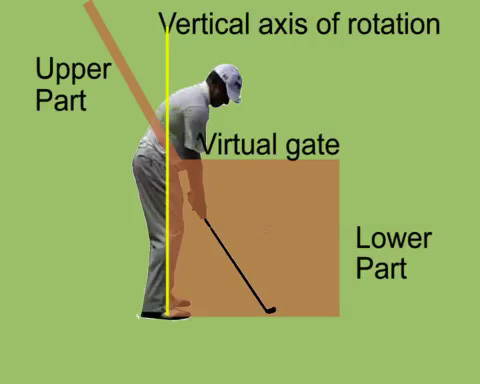 A virtual gate hinged to the vertical axis of rotation in which the club is contained through the lower part action. 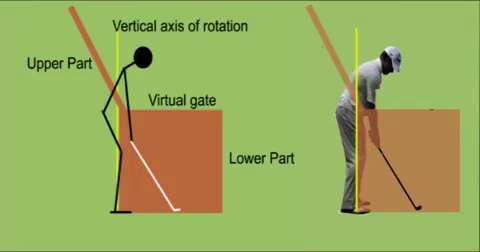 Go to A logical Golf Swing Concept for detailed explanation and illustration. In the following comparison to the stickman swing, in accordance with the concept, the close matching of the Lee Westwood technique is evidenced by pausing the video slider button at the key positions at Ball address; End of the takeaway; Start and end of the sweep-thru-impact. The nearer a golfer's technique fits to that swing concept the higher the level of consistent performance as evidenced by the 14 major victories and the long period at World No.1 ranking enjoyed by Tiger Woods and Ben Hogan’s brilliant record from 50 years past. It is unlikely that the techniques of masters such as Lee Westwood, Tiger Woods and other elite players have been developed consciously to include vital aspects of that concept but rather through a process in which actions, which happen to conform with the concept, are gradually recognized and adopted as essential components of their techniques after many years of coaching input, trial and error and striking many thousands of balls in practice.